Welcome to my first post for the IWSG! I'm not sure why it has taken me two and a half years of blogging before joining the group, but better late than never. And I was shown such kindness by the IWSG and the writing community after what happened last November that it seems like the least I can do. My first post really has to focus on the incredible people that make up this community. I know it's been said before, but they rock one's socks off! I have been touched by many of the kind and heartfelt comments I have been left, first on my last post in November after the news broke on Facebook, then on my tribute to Andrew and my update on my writing progress. I want to quote some here but then I would want to post them all and it would take too long. It's breathtaking to think that people across the world that I have never actually "met" are holding me and my family in their thoughts, and are concerned about how we are coping. I really did not think about writing for a long time after Andrew passed away, and everything seemed pointless. I didn't even have any noteworthy ideas. Then gradually it dawned on me that this was not the way Andrew approached life. Other things were going on. My stepdaughter Hannah started college in January to pursue her teaching career, inspired by her brother's forward thinking example. The A-Z Challenge rolled around, and inspired by others' energetic efforts, I set my own challenge of completing the revisions on my WIP by the end of April. I was surprised by the amount of progress I made once I got going. But without those supportive voices, if none of this existed, I think it would have taken me a lot longer to get going. I would have withdrawn into myself. A virtual pat on the back and some words of kindness actually can work wonders. I'm going to end with an example of what this fantastic bunch of people can do working together, for those who haven't seen it. We released 50 red balloons up to heaven at Andrew's funeral. I didn't realise there would be balloons flying around the world! Be sure to check out the other awesome IWSG blogs. Welcome to IWSG! It makes sense that it took you awhile to get back in the swing of things after a loss like that. I'm glad that you're finding your way back to writing, and I look forward to reading your monthly IWSG posts. Welcome to IWSG, Nick. Glad your bloggy friends around the globe were able to help at such a difficult time. *hugs* I'm pleased to hear you're finding a way forward, and that you had so much support from the blogging community! It's the support and encouragement of this community that makes it so special. Blessings that it got you moving again. And that was a wonderful and touching video. Welcome to the group! I'm positive I wouldn't have got as far as I have without the support of so many wonderful people. You just needed time to heal. But I'm glad you're back and writing again. Nick, it is beautiful to see the video again. I'm so glad you're part of the IWSG, welcome! We're glad you're here. So happy you're writing again too. Hugs to you and your family! Welcome to IWSG!!! Love that you are here! And I love that you are back into writing! And, of course, those red balloons got me teary. Prayers for comfort for you and your family ongoing. The balloons are amazing. My family's thoughts and prayers are with you, a little drop in the huge support of this amazing group. Welcome to IWSG! It's wonderful you're back to writing. And I love that video. Amazing and so touching. It is so very hard to lose someone. I totally understand the feeling of wanting to withdraw. I know, for me, it's hard to get the mind on writing or even seeing the need to write or do, after such a loss. I'm glad things are settling down a bit for you and you're having fun with this WIP. Welcome back, Nick--and welcome to IWSG. That loss has to be SO HARD to move past. I can't imagine. Andrew will always be with you; I'm glad you are getting back to it, though. I'm so glad to see you back blogging, Nick. And I'm glad you and your family are beginning to enjoy life again after your terrible loss. Take care and best of luck with your writing. IWSG #224 until Alex culls the list again. I read some of your back posts last night. I think it's truly inspirational that the blogging community came forward to support you. It's a testament to how powerful blogging can be. That's what it's all about. One step at a time...but blogging can help with healing. L.G. - The video is amazing, we watched it countless times. Getting there, one step at a time! Suzanne - They're (you're) great! Kyra - Special thanks for spearheading the video. I know it took a bit of organising! Alex - We really need our friends at times like these, and I'm fortunate to have so many! Annalisa - Yeah, I think back to when I was writing "alone". Technically I had more time without blogging, but I got much less done! Diane - I've been in my contemplation phase, but feeling ready to start again. Tonja - I love that so many people released a balloon for Andrew! Christine - I am enjoying writing again. Keeping busy helps. Sia - It took me a while to get my mind on it, but I knew Andrew wouldn't want us to be sitting doing nothing, because that wasn't what he was about. Hart - He is always with us. We take the dogs and go and visit his grave every day and talk to him, too. Julie - Thanks. It still feels raw in a lot of ways, but we are trying to get on. Laura - I've never known a better bunch! Stephanie - There's so much warmth and support, it has to help a little. Nancy - Thanks! I will have a look for that. Welcome to the IWSG. I'm fairly new here, too, and have found everyone is wonderful. I know you will rediscover life's blessings and joy. I've been a little out of touch lately and didn't realize you lost Andrew. I'm really sorry to hear that. My brother-in-law died last February unexpectedly - the kindness of people in the community where we live was overwhelming. This blogging group is like that too and feels like a real community although we are everywhere and likely will never meet. What a wonderful tribute to a wonderful character. Deeply moving. What a beautiful tribute to Andrew! I didn't know a video was made. The people in the blog community are awesome! I'm glad you're back and getting into the groove of things again! I knew you'd find your way back, Nick. Healing takes time and you were wise to take that time. I'm glad you jumped into IWSG. 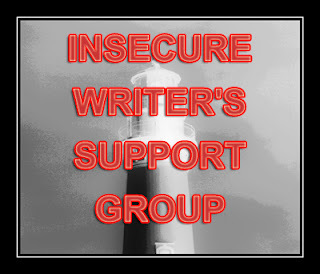 It has helped me for a while now, in fact, I might not be posting anything if I didn't have the connection with others who share some of this writer Insecurity. I loved the beautiful tribute to Andrew. It's such an amazing community, isn't it? So great to have you on the IWSG wagon. Writers are amazing. Nick, welcome. I didn't know you, or know about Andrew, so I scrolled down and read a few posts. The balloon video was stunning and while I know you will always grieve, how blessed you are to have had such an amazing spirit touch your life. And clearly you shared the joy Andrew brought you with many. The pictures of Andrew pulled me right in. You know, already, what community can do, glad now that you have joined a place where you will find even more support. Nick, grieving - it makes everything else pale in comparison. You are so strong and I am so glad you have found your way back to your writing. Welcome to ISWG. You will find comfort here in this part of your journey as well. Welcome back. Take your time getting settled in again. Wishing you and your family all the best. Welcome to the IWSG. Glad you are writing again and that the blogging community has been so awesome. Take care! I'm so thrilled to hear you are back on the proverbial bike again. It's wonderful you've joined our group! Welcome!! I wish we lived on the same continent so I could give you a big hug! I've really missed you. :( But it's so so so so good to hear from you again! I can't say I understand completely, but when my friend Chris died two years ago, he was like a second dad to me and after that I didn't want to write. It was too painful, but I remembered he wouldn't have wanted me to give up. He always supported my dream. I never got tired to see that video. Touches me everytime. I'm glad you realize the best way to honor Andrew is by living to the fullest. Welcome back. I'm glad you've joined, Nick! Congratulations to Hannah; I wish her well. And I'm happy that you're back to living life to the fullest. Andrew has created a lot to live up to. Its good to see your face again around the blogverse Nick. Welcome to IWSG, Nick. I'm relieved to hear that the writing community had been a source of comfort for you during what had been a challenging time for you and your family. What a beautiful tribute video. It's uplifting to see such supportive people are out there! When I think of the blogging community and all that it has done for me it makes me smile and brings tears to my eyes. I may never meet any of you, but you're like family. I'm so glad you are here with us! And, thank you for the support. Welcome aboard, Nick! Glad you decided to take up writing again and, you're absolutely right, this community does, indeed, rock! I love how your son continues to inspire you. As difficult as it is to grieve, there is so much joy in the fact that his voice lives on. Ever since the original group of mental health bloggers that I was part of when I started blogging back in 2005 dissolved, I've never found any sort of supportive group. You're right, it does help to know that someone somewhere has your back. Good luck to your stepdaughter on her journey through higher education! I hope it doesn't sound trite, but I believe your son will always continue to watch over you. I can't imagine such a terrible loss. Thanks so much for visiting The Cheese Whines. I just got tearful when I watched this for the second time. Bless you and yours, Nick. Welcome back, mate. Welcome back. PS: Thanks for sharing that tribute to Andrew. He was obviously an amazing young man, and I know he is sorely missed by your entire family. Take care and good luck with the writing side of things. It's great to see you back, and you're a welcome addition to the IWSG! It was very heartwarming to see the special tribute for Andrew again. I'm glad that you and your family have started to move forward, and I hope that Hannah's first semester has gone well. Congrats on accomplishing so much on your WIP! Welcome to an amazing group! Thanks for posting the video again. I'd heard a lot about it, but hadn't actually seen it. Wow, I know almost all those folks, and the idea of balloons all over the world for Andrew just gives me goosebumps. Good for you for focusing on what you needed to do and moving ahead at your own pace of healing. That is such a powerful story!! I'm so glad of all the support you've received and am constantly in awe of the writing community, which is so incredible. I hope you know that part of what makes people want to rally around you is that YOU are such a warm and wonderful person. Nick, I hadn't met you yet, back in November, but I had seen Facebook light up with many caring thoughts, condolences, and well wishes. I'm looking forward to following your blog and getting to know you better. Hi Nick .. that was an amazing video to you, Andrew, Heather and family .. and yes the blogging community is an amazing space .. so supportive and so thoughtful .. So pleased you've joined the IWSG - and I'm sure they'll continue on supporting you, as I know I will .. Sorry I'm so late visiting this post, Nick. What a beautiful video. It was great to watch it again.